Answer XAT Decision Making Question no. 1 – 5 on the basis of the information given in the following case. 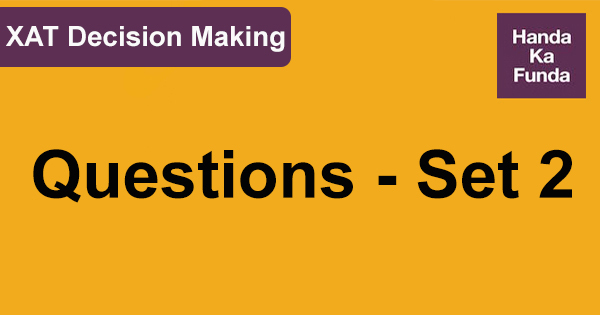 XAT Decision Making Question 3. Which, out of the following, would weaken the need for hiring another consulting company (keep the information supplied in the previous question in mind) to arrive at the final decision? XAT Decision Making Question 4. Rahul has arrived at the conclusion that this is not the best time to start a new distillery plant as the market forces do not seem to favorable at the time. Yet, at the back of his mind, there is the nagging doubt that since his wife is opposed to the idea of moving out of North India and has made her opinion public to some of his colleagues, his decision may not be viewed as impartial. Which, out of the following, is the best course of action that he can adopt in the given situation? XAT Decision Making Answer 1. Build his team of lieutenants who are then assigned to handle the different works, thus relieving Rahul of some of the responsibilities. XAT Decision Making Answer 3. The essential details required for making a final decision can be accrued only by first-party physical research. XAT Decision Making Answer 4. He should maintain his professional standards and present his case purely on the basis of the facts and figures to justify his recommendation. XAT Decision Making Answer 5. Lack of migratory labor in the region, to be employed at the distillery.